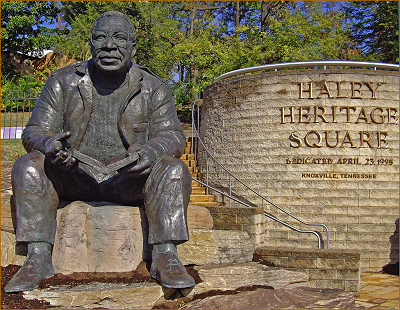 A 13-foot bronze Alex Haley Statue in a striking pose accents Haley Heritage Square. The Statue, sculpted by internationally acclaimed sculptor Tina Allen, depicts Haley gazing toward the Smoky Mountains. Alex Haley spent the last fourteen years of his life in East Tennessee. Haley Heritage Square’s development involved a broad cross section of the Knoxville, Tennessee and our national and international communities. Construction began in the fall of 1994 and the African-American Appalachian Arts, Inc., celebrated with the Greater Knoxville Community by unveiling Haley Heritage Square during the state Bicentennial, June 1996. Haley Heritage Square stands as a permanent tribute to our cultural diversity, integrity, and good-will for all humanity. Haley Heritage Square is located on the slopes of Morningside Park, a green space with a commanding view of historic Knoxville, the downtown business district and the Smoky Mountains. The site is easily accessible to interstate travelers. Above the park, at the top of the gently sloping hillside, is Haley Heritage Square. Long one of the most beautiful stops on the fall color tour, the park is a favorite of bicyclists, walkers and joggers; readings are held. The existing facility is complemented by the addition of Heritage Walk, an area dedicated to other well-known writers and prominent Tennesseans, as well as an amphitheater for special presentations and events. The focal point of the Square is a 13 foot high bronze statue of Alex Haley, created by internationally acclaimed artist Tina Allen. Allen has depicted Haley as a man of the people, dressed in casual clothes; sitting beside a stream; reading a book and gazing at the Smoky Mountains he loved. Visitors can gaze up at his warm, friendly face, forever lost in thought. His left hand holds a copy of his book Roots, while his right hand reaches out, as though punctuating a story he’s telling. In searching for his roots, this master storyteller found a story of love for humankind. The vision of Haley Heritage Square also includes a visitor center, located high on a hill, where people can learn more about the author, and the history and culture of the region. That vision includes programs; such as literacy classes, writing workshops, documentaries and scholarships. These programs will stand as a living memorial to a great humanitarian. Because Haley’s monumental work Roots has been translated into more than 38 languages, Haley Heritage Square could attract visitors from around the globe. How fitting that these people, from many different backgrounds, will not only have a place to do their genealogical research, but will also have a place for family reunions.